Kill Me Three Times the new crime thriller from Kriv Stenders (Red Dog, Boxing Day). Principal photography began on the film in Western Australia on 16th September and concluded late last month. 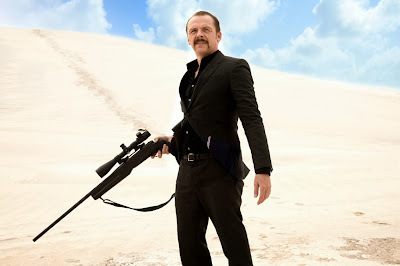 The film stars Simon Pegg, Sullivan Stapleton, Alice Braga, Teresa Palmer, Bryan Brown, Callan Mulvey and Luke Hemsworth. With an original screenplay by James McFarland, the film is produced by Laurence Malkin and Share Stallings (the team behind Death At A Funeral and A Few Best Men) and Tania Chambers, the former CEO of Screen New South Wales. The story takes place in an Australian surfing town, where a young singer, portrayed by Alice Braga, is the thread that binds three tales of murder, blackmail and revenge. Simon Pegg will play a mercurial assassin, hired by her wealthy husband (Callan Mulvey), Sullivan Stapleton plays a gambling addict that attempts to pay off his debts through a risky life insurance scam, whilst Teresa Palmer plays a small town Lady Macbeth who masterminds the scheme. Luke Hemsworth will also star as Braga's love interest, a local surfer who hopes to rescue the young woman from Pegg's telescopic sights.